I completely understand why Weebly has so many fans. It’s one of the easiest website builders I’ve ever used and allows just about anyone to create a functional website in an hour or two. But just like every other platform out there, it’s not perfect. While the simplicity of Weebly it’s what first draws many people in, it can also be a disadvantage for others and leave them craving more advanced features and seeking an alternative. Now, rather than simply reeling off a random list of Weeby’s competitors, I think it’s important to first find out what Weebly do well and what they don’t. This then allows us to find alternatives which can “plug” those gaps and find something which suits you better. If you in a hurry and haven’t got time to get into the fine details, I’ve left you a list below so you can see some of your options. Click on any of the links to read the full review. Wix – Good for beginners and small businesses. Squarespace – Good for visual businesses, online stores, photographers, artists etc. Jimdo – Good for stores, multi-lingual sites and people whose first language isn’t English. uKit – Good for small businesses as that’s their sole focus. #1 Ease of use: Weebly allows even newbies to quickly and easily create a site thanks to their user-friendly interface and drag ‘n’ drop technology. #2 Pre-designed layouts. One of the reasons it takes so little time is because the templates already have professionally designed layouts so you can jump in and swap out the text and images for your own. #3 Weebly App Center: A plethora of add-on features which can be installed at the click of a button such as booking forms, Social buttons, testimonial builder, and pricing charts to name but a few. #4 Ability to create a membership site: Keep certain pages of your site private, create courses, and pick and choose who has access. One of only few website builders to offer this feature. #5 eCommerce: Ability to sell physical & digital products online. Accept PayPal and major credit cards, manage inventory, shipping, & tax calculators, and the option to create variants of each product. #6 Mobile-friendly: Your site will look great and function properly on smartphones and tablets without any additional effort on your part. #7 Try before you buy: Free website option with discreet ads allows you to test it before committing. #1 Although the templates are well designed, I feel they are a little generic and I’d like to see more of them. #2 Weebly only allows you to customize the basics. Elements that you’d think are customizable may not be as I find out when creating my test site. #3 I said above the site is mobile-friendly out of the box which is great but I prefer the ability to customize the mobile version to give my mobile visitors a better user experience which Weebly doesn’t allow. I wouldn’t be at all surprised if you’d come across Wix when doing your initial research. It’s one of their closest rivals and possibly the best Weebly alternative depending on what you want to achieve with your website. Wix has many things in common with Weebly such as ease of use, pre-designed template layouts, an App Market with plenty of tools to add functionality to your site, and a strong suite of eCommerce tools. Choose from over 500 templates including plumbers, florists, salons, weddings, photography, hobbies, and just about everything in between. With Wix, you have more freedom. Move text and images wherever you wish on the page. With Weebly, you’re a little more restricted. Wix ADI provides more hands-off, futuristic approach to website building. Create your site by answering a series of questions and watch as Wix uses your answers and information from social sites to create a custom site for you. Seperate mobile editor allows you to customize your mobile site. One of my favorite features is the mobile menu bar which allows visitors to click your phone number and call you straight from their smartphone. With a free site, Wix ads are a lot more prominent than Weebly’s. Once you’ve chosen a template, you can’t swap it without starting over. Wix has a free website option (no time limit) and a choice of 5 premium plans ranging from $5 to $25 per month when billed annually. Visit Wix – Get started with Wix for free to see if it’s the right platform for you. Wix Review – Take a closer, more intimate look at Wix including exactly what to expect and pricing. Squarespace lends itself very well to people who are looking to produce a high quality, professional looking website and you only have to take a look at their templates to see that. In addition, Squarespace throws in a plethora of customization options allowing you to truly make your site your own. This does however come at a price, and that is Squarespace has a slightly steeper learning curve than Weebly and the other platforms on this page for that matter. Overall, Squarespace is a great fit for people who have great quality images and want to show them off such as businesses, photographers, artists, and weddings. Gorgeous high-quality templates, some of the best around. Tons of customization options allowing you to create a truly unique website. Makes for a great blogging alternative to Weebly or indeed WordPress. Squarespace boasts a full range of online store features comparable to specialist eCommerce platforms. Fantastic help & support (I received an email response within an hour while creating my test site). A plethora of customization options means a slightly steeper learning curve than Weebly. No App store like Weebly or Wix. You can add functionality with third-party integrations recommended by Squarespace but the process isn’t quite as streamlined from my own experience. No free website option. Instead, you’ll get a 14-day free trial. 14-day free trial with 4 premium plans available ranging from $12 – $40 per month (billed annually). Visit Squarespace – Take Squarespace for a 14-day free trial. Squarespace Review – Take a closer, more intimate look at Squarespace including exactly what to expect and pricing. You’d be forgiven for not having heard of Jimdo before as it doesn’t seem to get mentioned as much as Weebly, Wix, or Squarespace. However, Jimdo has a huge global presence and over 20 million websites have been created using the platform. Jimdo has a strong focus on eCommerce and is a great option for anyone whose first language isn’t English or wishes to create a multi-lingual website. Jimdo supports English, German, French, Spanish, Japanese, Italian, Dutch, Russian, and Swedish languages. Ability to create multi-lingual websites for users in different countries. Like Wix, Jimdo has released “Dolphin”, a way for you to get a customized site from Jimdo by answering a series of questions about your business. Dolphin is still in its early stages. Quickly create an online store with a range of easy to use eCommerce tools. 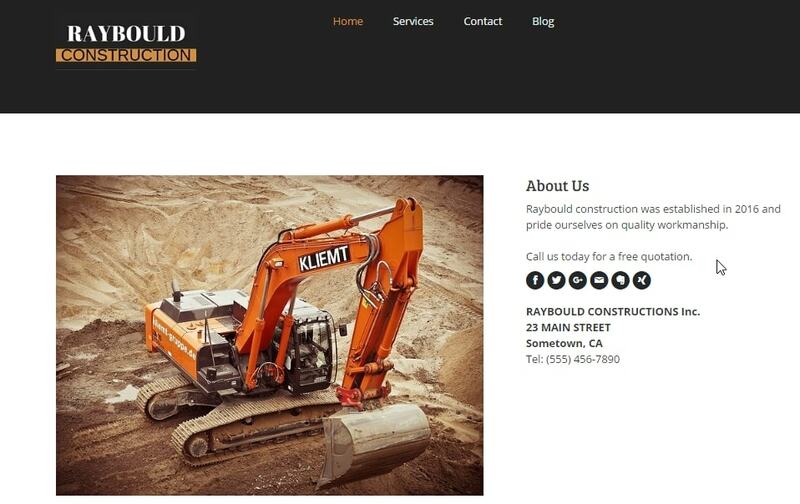 Use a tablet or smartphone to create your website if you wish. Jimdo shouldn’t take you long to master although it’s not quite as easy as Weebly’s drag ‘n’ drop technology. You won’t have as many templates to choose from and I feel they look a little outdated in comparison. Apart from images, text, and fonts, the templates aren’t very customizable unless you know how to code. How much does Jimdo cost? Jimdo has a very flexible free plan and if it’s only a basic site you’re after, it may be all you need. If you require extra features, Jimdo offers two premium plans costing $7.50 and $20 per month (billed annually). Visit Jimdo – Take Jimdo for a free test drive to see if it’s the right platform for you. Jimdo Review – Take a closer, more intimate look at Jimdo including exactly what to expect and pricing. uKit focuses solely on helping people create a business website whereas Weebly is more generic. Similar to Weebly, uKit is easy to use and everything the website editor is neatly laid out and all of the tools are within easy reach. Choose from hundreds of templates such as finance, restaurants, construction, education, medical care, and landscaping plus many, many more. Your contact details will be immediately visible to mobile visitors allowing people to “click to call” directly from their smartphones. Don’t want to do-it-yourself? uKit offers a done for you option from the team costing just $50. A drop in the ocean compared to hiring a professional. I found setting up an online booking form a little tedious and would have expected it to be a bit simpler for a business focused platform. You’ll only find very basic image editing tools such as the ability to crop a picture and not much else. How much does uKit cost? When you create an account, you’ll have access to a 7-day free trial. After which, you can choose to upgrade to one of their premium plans ranging from $4 – $12 per month when billed annually. Visit uKit – Take uKit for a 7-day free trial. uKit Review – Take a closer, more intimate look at uKit including exactly what to expect and pricing. I hope you’ve found at least one alternative here that’s caught your eye. This is by no means an exhaustive list as I could have quite easily reeled of another twenty website builders. The problem with that is, you’d be no better off than before and it would still be like searching for a needle in a haystack. 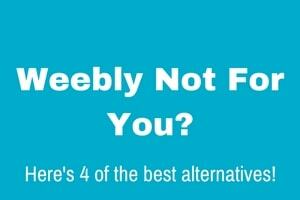 Instead, I handpicked 4 platforms for you that offer features that Weebly doesn’t. My best advice is to choose one, two, maybe even three of the platforms above and sign up for a free account/trial which will allow you to get a feel for the platform without any financial commitment. Then you can decide which one is the best fit for you. I’d love to know what it is you don’t like about Weebly or what you think they’re missing. You can let me know in the comments section below as well as any questions you may have about any of the other platforms we’ve covered here today. Best 4 Wix Alternatives For People Who Don’t Like Wix! 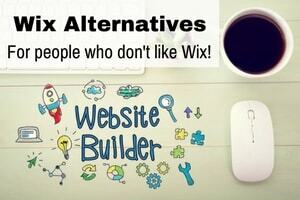 next post: Best 4 Wix Alternatives For People Who Don’t Like Wix!